This week, we had an interview with HelpAround, a company which has harnessed the power of the internet and mobile phones for the benefit of those suffering chronic diseases. It all began when Yishai Knobel and Shlomi Aflalo met randomly, after not seeing each other for several years. They knew each other from their joint service in one the top technological units in the Israeli army. Yishai has just returned from a long stay in the US, where he attended the MIT Sloan business school. They started a conversation about some ideas they had, and found that they basically had a similar direction on their minds. At that point, the idea was to create a network of people who can help each other, when in need. However, as they soon learned, people are not so keen on helping each other, just for the heck of it. Apparently, people need a really good reason to help a stranger, or as Yishai puts it, people need to feel “camaraderie” – a struggle against a common enemy. This is something they learned over a long period of trial and error. Though they asked their friends and families to join the HelpAround network, on the day of the launch, nobody seemed to care. This was a major disappointment for the two, but they didn’t give up. They know that eventually, they will find a model that works. The light at the end of that tunnel came from one of their investors, who had a diabetic child. He told them a story about taking his kid to a football game. When they arrived, they discovered they were out of test strips, which is used for the process of measuring the amount of sugar in the blood. They didn’t want to go back home to get the test strip, but had no choice as they had to get it. However, since today there are many people dealing with diabetes, the chances are that someone around them could have helped solve this situation quickly and that would save them a lot of trouble. This story helped Yishai and Shlomi understand when exactly people would be willing to join their network – when they feel strongly connected to the person they are helping. So they decided to focus on people suffering from illness, as those people have a very clear goal – beating their illness. And so, they turned their previously “general” network for helping people around, to a very focused network, aimed to help diabetic people get what they need, when they need it, to deal with situations like the one their investor told them about. 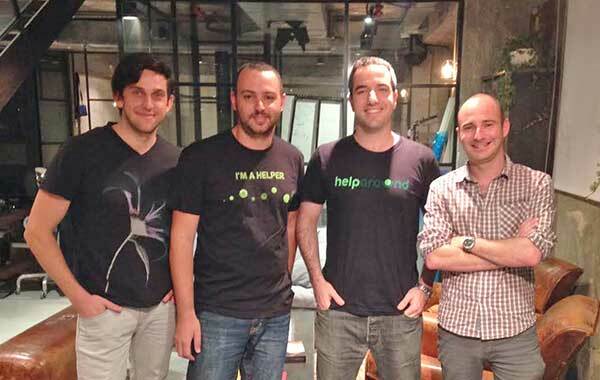 HelpAround is located in the “SOSA” hub for startups in Tel Aviv. They are growing rapidly, and believe that they can change connect the web into the physical world so not only diabetic people can live better, but also all types of people suffering from chronic diseases.